Registration: Registration for this workshop is now closed. You may also be interested in All Things Paper: More Marvels of Marbling, March 22. Carey Watters embarks on a series of workshops at Lynden that introduce participants to a variety of techniques related to paper, from surface design to bookmaking. Though there will be a progressive element to the workshops, beginning with simpler processes and moving toward more complex techniques and structures, they are designed so that you can take them sequentially or on their own. 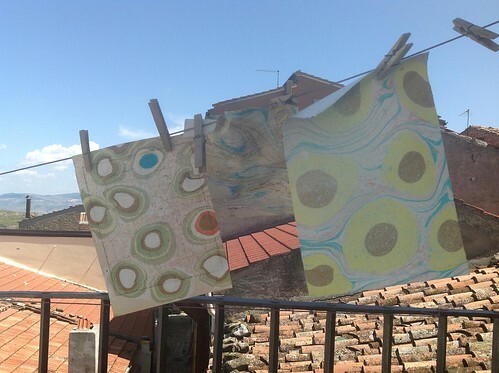 The first series will focus on paper marbling and book structures made from marbled paper. Marbling is a mysterious art form that is fun and accessible to people of all ages and abilities. Students will learn techniques for marbling paper and finish the day by making a book with some of their own marbled paper.